Mount Misen (弥山, Misen) is the sacred mountain on Itsukushima in Hatsukaichi, Hiroshima, Japan, and is the highest mountain on the island at 535 m; it is situated within the World Heritage area of Itsukushima Shrine. The sea around the island (Seto Inland Sea) and all of the island are within Setonaikai National Park. The north side of the mountain is covered by primeval forest which is protected by Hiroshima prefecture. The foot of the mountain has Momijidani-Kōen (紅葉谷公園, Maple Valley Park). According to the website of Miyajima Tourist Association, Mount Misen was visited by Kūkai in the year 806, the 1st year of the Daidō era. Since ancient times, the mountain has been an important destination for religious visitors. ^ a b c "弥山(みせん)とは - コトバンク" (in Japanese). kotobank. Retrieved December 30, 2017. ^ "世界遺産 文化遺産オンライン" (in Japanese). Agency for Cultural Affairs. Retrieved December 30, 2017. ^ "瀬戸内海国立公園(広島・愛媛地域)" (PDF) (in Japanese). Ministry of the Environment. Retrieved December 30, 2017. 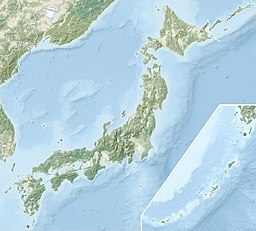 ^ "広島県の文化財 - 瀰山原始林 - 広島県ホームページ" (in Japanese). Hiroshima Prefecture Board of Education. Retrieved 7 October 2015. ^ "人と神々が共に生きる島～宮島　自然めぐり：もみじ谷公園・大元公園・弥山・宮島ロープウェー" (in Japanese). Hatsukaichi City. Retrieved December 30, 2017. ^ "歩いて登山 3ルート 観光・登山モデルコース 一般社団法人宮島観光協会" (in Japanese). Miyajima Tourist Association. Retrieved December 30, 2017. This page was last edited on 30 December 2017, at 21:16 (UTC).